The Dodd–Frank Wall Street Reform and Consumer Protection Act (commonly referred to as Dodd–Frank) is a United States federal law that was enacted on July 21, 2010. The law overhauled financial regulation in the aftermath of the financial crisis of 2007–2008, and it made changes affecting all federal financial regulatory agencies and almost every part of the nation's financial services industry. 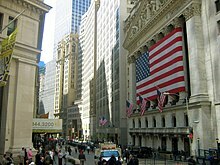 Responding to widespread calls for changes to the financial regulatory system, in June 2009 President Barack Obama introduced a proposal for a "sweeping overhaul of the United States financial regulatory system, a transformation on a scale not seen since the reforms that followed the Great Depression". Legislation based on his proposal was introduced in the United States House of Representatives by Congressman Barney Frank, and in the United States Senate by Senator Chris Dodd. Most congressional support for Dodd-Frank came from members of the Democratic Party, but three Senate Republicans voted for the bill, allowing it to overcome the Senate filibuster. Dodd-Frank reorganized the financial regulatory system, eliminating the Office of Thrift Supervision, assigning new responsibilities to existing agencies like the Federal Deposit Insurance Corporation, and creating new agencies like the Consumer Financial Protection Bureau (CFPB). The CFPB was charged with protecting consumers against abuses related to credit cards, mortgages, and other financial products. The act also created the Financial Stability Oversight Council and the Office of Financial Research to identify threats to the financial stability of the United States, and gave the Federal Reserve new powers to regulate systemically important institutions. To handle the liquidation of large companies, the act created the Orderly Liquidation Authority. One provision, the Volcker Rule, restricts banks from making certain kinds of speculative investments. The act also repealed the exemption from regulation for security-based swaps, requiring credit-default swaps and other transactions to be cleared through either exchanges or clearinghouses. Other provisions affect issues such as corporate governance, 1256 Contracts, and credit rating agencies. Dodd-Frank is generally regarded as one of the most significant laws enacted during the presidency of Barack Obama. Studies have found the Dodd–Frank Act has improved financial stability and consumer protection, although there has been debate regarding its economic effects. In 2017, Federal Reserve Chairwoman Janet Yellen stated that "the balance of research suggests that the core reforms we have put in place have substantially boosted resilience without unduly limiting credit availability or economic growth." Some critics have argued that the law had a negative impact on economic growth and small banks, or failed to provide adequate regulation to the financial industry. Many Republicans have called for the partial or total repeal of the law. The financial crisis of 2007–10 led to widespread calls for changes in the regulatory system. In June 2009, President Obama introduced a proposal for a "sweeping overhaul of the United States financial regulatory system, a transformation on a scale not seen since the reforms that followed the Great Depression". Tools for financial crisis, including a "resolution regime" complementing the existing Federal Deposit Insurance Corporation (FDIC) authority to allow for orderly winding down of bankrupt firms, and including a proposal that the Federal Reserve (the "Fed") receive authorization from the Treasury for extensions of credit in "unusual or exigent circumstances"
The Volcker Rule was not included in Obama's initial June 2009 proposal, but Obama proposed the rule later in January 2010, after the House bill had passed. The rule, which prohibits depository banks from proprietary trading (similar to the prohibition of combined investment and commercial banking in the Glass–Steagall Act), was passed only in the Senate bill, and the conference committee enacted the rule in a weakened form, Section 619 of the bill, that allowed banks to invest up to 3 percent of their tier 1 capital in private equity and hedge funds as well as trade for hedging purposes. 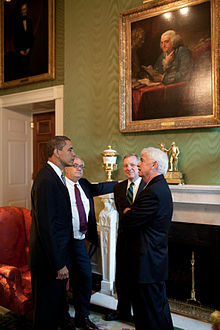 On December 2, 2009, revised versions of the bill were introduced in the House of Representatives by then–financial services committee chairman Barney Frank, and in the Senate Banking Committee by former chairman Chris Dodd. The initial version of the bill passed the House largely along party lines in December by a vote of 223 to 202, and passed the Senate with amendments in May 2010 with a vote of 59 to 39 again largely along party lines. The bill then moved to conference committee, where the Senate bill was used as the base text although a few House provisions were included in the bill's base text. The final bill passed the Senate in a vote of 60-to-39, the minimum margin necessary to defeat a filibuster. Olympia Snowe, Susan Collins, and Scott Brown were the only Republican senators who voted for the bill, while Russ Feingold was the lone Senate Democrat to vote against the bill. One provision on which the White House did not take a position and remained in the final bill allows the SEC to rule on "proxy access"—meaning that qualifying shareholders, including groups, can modify the corporate proxy statement sent to shareholders to include their own director nominees, with the rules set by the SEC. 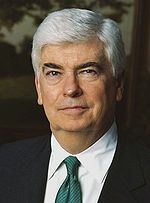 This rule was unsuccessfully challenged in conference committee by Chris Dodd, who—under pressure from the White House—submitted an amendment limiting that access and ability to nominate directors only to single shareholders who have over 5 percent of the company and have held the stock for at least two years. Since the passage of Dodd-Frank, many Republicans have called for a partial or total repeal of Dodd-Frank. On June 9, 2017, The Financial Choice Act, legislation that would "undo significant parts" of Dodd-Frank, passed the House 233–186. On March 14, 2018, the Senate passed the Economic Growth, Regulatory Relief and Consumer Protection Act exempting dozens of U.S. banks from the Dodd–Frank Act's banking regulations. On May 22, 2018, the law passed in the House of Representatives. On May 24, 2018, President Trump signed the partial repeal into law. The Dodd–Frank Wall Street Reform and Consumer Protection Act is categorized into 16 titles and, by one law firm's count, it requires that regulators create 243 rules, conduct 67 studies, and issue 22 periodic reports. To promote the financial stability of the United States by improving accountability and transparency in the financial system, to end "too big to fail," to protect the American taxpayer by ending bailouts, to protect consumers from abusive financial services practices, and for other purposes. Of the existing agencies, changes are proposed, ranging from new powers to the transfer of powers in an effort to enhance the regulatory system. The institutions affected by these changes include most of the regulatory agencies currently involved in monitoring the financial system (Federal Deposit Insurance Corporation (FDIC), U.S. Securities and Exchange Commission (SEC), Office of the Comptroller of the Currency (OCC), Federal Reserve (the "Fed"), the Securities Investor Protection Corporation (SIPC), etc. ), and the final elimination of the Office of Thrift Supervision (further described in Title III—Transfer of Powers to the Comptroller, the FDIC, and the FED). As a practical matter, prior to the passage of Dodd–Frank, investment advisers were not required to register with the SEC if the investment adviser had fewer than 15 clients during the previous 12 months and did not hold himself out generally to the public as an investment adviser. The act eliminates that exemption, rendering numerous additional investment advisers, hedge funds, and private equity firms subject to new registration requirements. Certain nonbank financial institutions and their subsidiaries will be supervised by the Fed in the same manner and to the same extent as if they were a bank holding company. To the extent that the Act affects all federal financial regulatory agencies, eliminating one (the Office of Thrift Supervision) and creating two (Financial Stability Oversight Council and the Office of Financial Research) in addition to several consumer protection agencies, including the Bureau of Consumer Financial Protection, this legislation in many ways represents a change in the way America's financial markets will operate in the future. Few provisions of the Act became effective when the bill was signed. Title I, or the "Financial Stability Act of 2010," outlines two new agencies tasked to monitor systemic risk and research the state of the economy and clarifies the comprehensive supervision of bank holding companies by the Federal Reserve. Title I creates the Financial Stability Oversight Council (FSOC) and the Office of Financial Research (OFR) in the U.S. Treasury Department. These two agencies are designed to work closely together. The council is formed of 10 voting members, 9 of whom are federal regulators and 5 nonvoting supporting members, to encourage interagency collaboration and knowledge transfer. The treasury secretary is chairman of the council, and the head of the Financial Research Office is appointed by the president with confirmation from the Senate. Title I introduced the ability to impose stricter regulations on certain institutions by classifying them as SIFI's (systemically important financial institutions); according to Paul Krugman, this has allowed institutions to reduce risk-taking so they could to avoid such classification. Under section 165d, certain institutions must prepare resolution plans (so-called living wills), the first round of which was rejected by the Federal Reserve System in 2014. The process can be seen as a way to regulate and reduce shadow banking activities by banking institutions. The Financial Stability Oversight Council is tasked to identify threats to the financial stability of the United States, promote market discipline, and respond to emerging risks in order to stabilize the United States financial system. At a minimum, it must meet quarterly. With a two-thirds vote, it may place nonbank financial companies or domestic subsidiaries of international banks under the supervision of the Federal Reserve if it appears that these companies could pose a threat to the financial stability of the United States. Under certain circumstances, the council may provide for more stringent regulation of a financial activity by issuing recommendations to the primary financial regulatory agency, which the primary financial agency is obliged to implement—the council reports to Congress on the implementation or failure to implement such recommendations. The council may require any bank or nonbank financial institution with assets over $50 billion to submit certified financial reports. With the approval of the council, the Federal Reserve may promulgate safe harbor regulations to exempt certain types of foreign banks from regulation. The Office of Financial Research is designed to support the Financial Stability Oversight Council through data collection and research. The director has subpoena power and may require from any financial institution (bank or nonbank) any data needed to carry out the functions of the office. The Office can also issue guidelines to standardizing the way data is reported; constituent agencies have three years to implement data standardization guidelines. It is intended to be self-funded through the Financial Research Fund within two years of enactment, with the Federal Reserve providing funding in the initial interim period. In many ways, the Office of Financial Research is to be operated without the constraints of the Civil Service system. For example, it does not need to follow federal pay-scale guidelines (see above), and it is mandated that the office have workforce development plans that are designed to ensure that it can attract and retain technical talent, which it is required to report about congressional committees for its first five years. Provided that the secretary of treasury, in consultation with the president, may also determine to appoint a receiver for a financial company. Also, the Government Accountability Office (GAO) shall review and report to Congress about the secretary's decision. When a financial institution is placed into receivership under these provisions, within 24 hours, the secretary shall report to Congress. Also, within 60 days, there shall be a report to the general public. The report on recommending to place a financial company into receivership shall contain various details on the state of the company, the impact of its default on the company, and the proposed action. To the extent that the Act expanded the scope of financial firms that may be liquidated by the federal government, beyond the existing authorities of the FDIC and SIPC, there had to be an additional source of funds, independent of the FDIC's Deposit Insurance Fund, used in case of a non-bank or non-security financial company's liquidation. The Orderly Liquidation Fund is to be an FDIC-managed fund, to be used by the FDIC in the event of a covered financial company's liquidation that is not covered by FDIC or SIPC. Initially, the fund is to be capitalized over a period no shorter than five years, but no longer than 10; however, in the event the FDIC must make use of the fund before it is fully capitalized, the secretary of the treasury and the FDIC are permitted to extend the period as determined necessary. The method of capitalization is by collecting risk-based assessment fees on any "eligible financial company"—which is defined as ". . . any bank holding company with total consolidated assets equal to or greater than $50 billion and any nonbank financial company supervised by the Board of Governors." The severity of the assessment fees can be adjusted on an as-needed basis (depending on economic conditions and other similar factors), and the relative size and value of a firm is to play a role in determining the fees to be assessed. 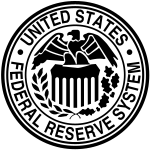 The eligibility of a financial company to be subject to the fees is periodically reevaluated; or, in other words, a company that does not qualify for fees in the present will be subject to the fees in the future if it crosses the 50 billion line, or become subject to Federal Reserve scrutiny. To the extent that a covered financial company has a negative net worth and its liquidation creates an obligation to the FDIC as its liquidator, the FDIC shall charge one or more risk-based assessment such that the obligation will be paid off within 60 months of the issuance of the obligation. The assessments will be charged to any bank holding company with consolidated assets greater than $50 billion and any nonbank financial company supervised by the Federal Reserve. Under certain conditions, the assessment may be extended to regulated banks and other financial institutions. Established inside the U.S. Bankruptcy Court for the District of Delaware, the panel is tasked with evaluating the conclusion of the secretary of treasury that a company is in (or in danger of) default. The panel consists of three bankruptcy judges drawn from the District of Delaware, all of whom are appointed by the chief judge of the United States Bankruptcy Court for the District of Delaware. In his appointments, the chief judge is instructed to weigh the financial expertise of the candidates. If the panel concurs with the secretary, the company in question is permitted to be placed into receivership; if it does not concur, the secretary has an opportunity to amend and refile his or her petition. In the event that a panel decision is appealed, the United States Court of Appeals for the Third Circuit has jurisdiction; in the event of further appeal, a writ of certiorari may be filed with the U.S. Supreme Court. In all appellate events, the scope of review is limited to whether the decision of the secretary that a company is in (or in danger of) default is supported by substantial evidence. Each of the financial regulatory agencies represented on the Council shall establish an Office of Minority and Women Inclusion that shall be responsible for all matters of the agency in relation to diversity in management, employment, and business activities. Title IV, or the "Private Fund Investment Advisers Registration Act of 2010," requires certain previously exempt investment advisers to register as investment advisers under the Investment Advisers Act of 1940. Most notably, it requires many hedge fund managers and private equity fund managers to register as advisers for the first time. Also, the act increases the reporting requirements of investment advisers as well as limiting these advisers' ability to exclude information in reporting to many of the federal government agencies. Title V—Insurance is split into two subtitles: A.) Federal Insurance Office, and B.) State-Based Insurance Reform. The office is headed by a director appointed for a career-reserved term by the secretary of the treasury. Generally, the Insurance Office may require any insurer company to submit such data as may be reasonably required in carrying out the functions of the office. A state insurance measure shall be preempted if, and only to the extent that, the director determines that the measure results in a less favorable treatment of a non–U.S. insurer whose parent corporation is located in a nation with an agreement or treaty with the United States. Subtitle B, also called the "Nonadmitted and Reinsurance Reform Act of 2010" applies to nonadmitted insurance and reinsurance. Regarding to nonadmitted insurance, the Act provides that the placement of nonadmitted insurance will be subject only to the statutory and regulatory requirements of the insured's home state and that no state, other than the insured's home state, may require a surplus lines broker to be licensed to sell, solicit, or negotiate nonadmitted insurance respecting the insured. The Act also provides that no state, other than the insured's home state, may require any premium tax payment for nonadmitted insurance. However, states may enter into a compact or otherwise establish procedures to allocate among the states the premium taxes paid to an insured's home state. A state may not collect any fees in relation to the licensing of an individual or entity as a surplus lines broker in the state unless that state has in effect by July 21, 2012, laws or regulations providing for participation by the state in the NAIC's national insurance producer database, or any other equivalent uniform national database, for the licensure of surplus lines brokers and the renewal of these licenses. Title VI, or the "Bank and Savings Association Holding Company and Depository Institution Regulatory Improvements Act of 2010," introduces the so-called Volcker Rule after former chairman of the Federal Reserve Paul Volcker by amending the Bank Holding Company Act of 1956. With aiming to reduce the amount of speculative investments on the balance sheets of large firms, it limits banking entities to owning no more than 3 percent in a hedge fund or private equity fund of the total ownership interest. All of the banking entity's interests in hedge funds or private equity funds cannot exceed 3 percent of the banking entity's Tier 1 capital. Furthermore, no bank with a direct or indirect relationship with a hedge fund or private equity fund "may enter into a transaction with the fund, or with any other hedge fund or private equity fund that is controlled by such fund" without disclosing the relationship's full extent to the regulating entity, and ensuring that there is no conflict of interest. "Banking entity" includes an insured depository institution, any company controlling an insured depository institution, and such a company's affiliates and subsidiaries. Also, it must comply with the Act within two years of its passing, although it may apply for time extensions. Responding to the Volcker Rule and anticipating of its ultimate impact, several commercial banks and investment banks operating as bank holding companies have already begun downsizing or disposing their proprietary trading desks. The rule distinguishes transactions by banking entities from transactions by nonbank financial companies supervised by the Federal Reserve Board. The rule states that generally "an insured depository institution may not purchase an asset from, or sell an asset to, an executive officer, director, or principal shareholder of the insured depository institution, or any related interest of such person . . . unless the transaction is on market terms; and if the transaction represents more than 10 percent of the capital stock and surplus of the insured depository institution, the transaction has been approved in advance by a majority of the members of the board of directors of the insured depository institution who do not have an interest in the transaction." Providing for the regulation of capital, the Volcker Rule says that regulators are required to impose upon institutions capital requirements that are "countercyclical, so that the amount of capital required to be maintained by a company increases in times of economic expansion and decreases in times of economic contraction," to ensure the safety and soundness of the organization. The rule also provides that an insured state bank may engage in a derivative transaction only if the law with respect to lending limits of the state in which the insured state bank is chartered takes into consideration credit exposure to derivative transactions. The title provides for a three-year moratorium on approving FDIC deposit insurance received after November 23, 2009, for an industrial bank, a credit card bank, or a trust bank either directly or indirectly owned or controlled by a commercial firm. In accordance with section 1075 of the law, payment card networks must allow merchants to establish a minimum dollar amount for customers using payment cards, as long as the minimum is no higher than $10. The Volcker Rule was first publicly endorsed by President Obama on January 21, 2010. The final version of the Act prepared by the conference committee included a strengthened Volcker rule by containing language by Senators Jeff Merkley (D-Oregon) and Carl Levin (D-Michigan), covering a greater range of proprietary trading than originally proposed by the administration, except notably for trading in U.S. government securities and bonds issued by government-backed entities. The rule also bans conflict-of-interest trading. The rule seeks to ensure that banking organizations are both well capitalized and well managed. The proposed draft form of the Volcker Rule was presented by regulators for public comment on October 11, 2011, with the rule due to go into effect on July 21, 2012. The Commodity Futures Trading Commission (CFTC) and the Securities and Exchange Commission (SEC) both regulate derivatives known as swaps under the Act, but the SEC has authority over "security-based swaps." The Act repeals exemption from regulation for security-based swaps under the Gramm–Leach–Bliley Act:55 The regulators are required to consult with each other before implementing any rule-making or issuing orders regarding several different types of security swaps. The CFTC and SEC, consultating with the Federal Reserve, are charged with further defining swap related terms that appear in Commodity Exchange Act (7 U.S.C. § 1a(47)(A)(v)) and section 3(a)(78) of the Securities Exchange Act of 1934 (15 U.S.C. § 78c(a)(78)). The title provides that "except as provided otherwise, no Federal assistance may be provided to any swaps entity with respect to any swap, security-based swap, or other activity of the swaps entity." An "Interagency Group" is constituted to handle the oversight of existing and prospective carbon markets to ensure an efficient, secure, and transparent carbon market, including oversight of spot markets and derivative markets. Title VIII, called the Payment, Clearing, and Settlement Supervision Act of 2010, aims to mitigate systemic risk within and promote stability in the financial system by tasking the Federal Reserve to create uniform standards for the management of risks by systemically important financial organizations and institutions by providing the Fed with an "enhanced role in the supervision of risk management standards for systemically important financial market utilities; strengthening the liquidity of systemically important financial market utilities; and providing the Board of Governors an enhanced role in the supervision of risk management standards for systemically important payment, clearing, and settlement activities by financial institutions." Title IX, sections 901 to 991, known as the Investor Protections and Improvements to the Regulation of Securities, revises the Securities and Exchange Commission's powers and structure, as well as credit rating organizations and the relationships between customers and broker-dealers or investment advisers. This title calls for various studies and reports from the SEC and Government Accountability Office (GAO). This title contains 10 subtitles, lettered A through J. To prevent regulatory capture within the SEC and increase the influence of investors, the Act creates an Office of the Investor Advocate, an investor advisory committee composed of 12 to 22 members who serve four-year terms, and an ombudsman appointed by the Office of the Investor Advocate. The investor advisory committee was actually created in 2009 and, therefore, it predates the Act's passage. However, it is specifically authorized under the Act. SEC is specifically authorized to issue "point-of-sale disclosure" rules when retail investors purchase investment products or services; these disclosures include concise information on costs, risks, and conflicts of interest. :160–1 This authorization follows up the SEC's failure to implement proposed point-of-sale disclosure rules between 2004 and 2005. These proposed rules generated opposition because they were perceived as burdensome to broker–dealers. For example, they would require oral disclosures for telephone transactions; they were not satisfied by cheap internet or email disclosures, and they could allow the customer to request disclosures specific to the amount of their investment. To determine the disclosure rules, the Act authorizes the SEC to perform "investor testing" and to rely on experts to study financial literacy among retail investors. Subtitle A provides authority for the SEC to impose regulations requiring "fiduciary duty" by broker–dealers to their customers. :158 Although the Act does not create such a duty immediately, it does authorize the SEC to establish a standard. It also requires the SEC to study the standards of care that broker–dealers and investment advisers apply to their customers and to report to Congress on the results within six months. Under the law, commission and limited product range would not violate the duty and broker–dealers would not have a continuing duty after receiving the investment advice. Subtitle B gives the SEC further powers of enforcement, including a "whistleblower bounty program", which is partially based upon the successful qui tam provisions of the 1986 Amendments to the False Claims Act as well as an IRS whistleblower reward program Congress created in 2006. The SEC program rewards individuals providing information resulting in an SEC enforcement action in which more than $1 million in sanctions is ordered. Whistleblower rewards range from 10 to 30 percent of the recovery. The law also provides job protections for SEC whistleblowers and promises confidentiality for them. Section 921I controversially limited FOIA's applicability to the SEC, a change partially repealed a few months later. The SEC had previously used a narrower existing exemption for trade secrets when refusing Freedom of Information Requests. Recognizing credit ratings that credit rating agencies had issued, including nationally recognized statistical rating organizations (NRSROs), are matters of national public interest, that credit rating agencies are critical "gatekeepers" in the debt market central to capital formation, investor confidence, and the efficient performance of the United States economy, Congress expanded regulation of credit rating agencies. 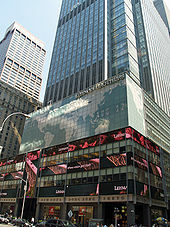 Subtitle C cites findings of conflicts of interest and inaccuracies during the recent financial crisis contributed significantly to the mismanagement of risks by financial institutions and investors, which in turn adversely impacted the US economy as factors necessitating increased accountability and transparency by credit rating agencies. Establish, maintain, enforce, and document an effective internal control structure governing the implementation of and adherence to policies, procedures, and methodologies for determining credit ratings. The law required credit risk retention regulations (where 5% of the risk was retained) within nine months of enactment,. Proposals had been highly criticized due to restrictive definitions on "qualified residential mortgages" with restrictive down-payment and debt-to-income requirements. In the August 2013 proposal, the 20% down-payment requirement was dropped. In October 2014, six federal agencies (Fed, OCC, FDIC, SEC, FHFA, and HUD) finalized their joint asset-backed securities rule. Subtitle G provides the SEC to issue rules and regulations including a requirement permitting a shareholder to use a company's proxy solicitation materials for nominating individuals to membership on the board of directors. The company is also required to inform investors regarding why the same person is to serve as the board of directors' chairman and its chief executive officer, or the reason that different individuals must serve as the board's chairman or CEO. This provision of the statute creates a guarantee of trust correlating a municipal adviser (who provides advice to state and local governments regarding investments) with any municipal bodies providing services. Also, it alters the make-up of the Municipal Securities rulemaking board ("MSRB") and mandates that the comptroller general conduct studies in relation to municipal disclosure and municipal markets. The new MSRB will be composed of 15 individuals. Also, it will have the authority to regulate municipal advisers and will be permitted to charge fees regarding trade information. Furthermore, it is mandated that the comptroller general make several recommendations, which must be submitted to Congress within 24 months of enacting the law. Subtitle I is concerned with establishing a public company accounting oversight board (PCAOB). The PCAOB has the authority to establish oversight of certified public accounting firms. Its provision allows the SEC to authorize necessary rules respecting securities for borrowing. The SEC shall, as deemed appropriate, exercise transparency within this sector of the financial industry. A council of inspectors general on financial oversight, composed of several members of federal agencies (such as the Department of the Treasury, the FDIC, and the Federal Housing Finance Agency) will be established. The council will more easily allow the sharing of data with inspectors general (which includes members by proxy or in person from the SEC and CFTC) with a focus on dealings that may be applicable to the general financial sector largely focusing on the financial oversight's improvement. Subtitle J provides adjustments to Section 31 of the Securities Exchange Act of 1934 regarding the "Recovery Cost of Annual Appropriation," the "Registration of Fees" and the "Authorization of Appropriations" provisions of the Act. Within the Bureau, a new Consumer Advisory Board assists the Bureau and informs it of emerging market trends. This Board is appointed by the Bureau's Director, with at least six members recommended by regional Fed Presidents. Elizabeth Warren was the first appointee of the President as an adviser to get the Bureau operating. The Consumer Financial Protection Bureau can be found on the web. The title requires that in determining capital requirements for regulated organizations, off-balance-sheet activities shall be taken into consideration, being those things that create an accounting liability such as, but not limited to"
For any residential mortgage loan, no mortgage originator may receive compensation that varies based on the term of the loan, other than the principal amount. In general, the mortgage originator can only receive payment from the consumer, except as provided in rules that may be established by the Board. Additionally, the mortgage originator must verify the consumer's ability to pay. A violation of the "ability to repay" standard, or a mortgage that has excessive fees or abusive terms, may be raised as a foreclosure defense by a borrower against a lender without regard to any statute of limitations. The Act bans the payment of yield spread premiums or other originator compensation that is based on the interest rate or other terms of the loans. In effect, this section of the Act establishes national underwriting standards for residential loans. It is not the intent of this section to establish rules or regulations that would require a loan to be made that would not be regarded as acceptable or prudential by the appropriate regulator of the financial institution. However, the loan originator shall make a reasonable and good faith effort based on verified and documented information that "at the time the loan is consummated, the consumer has a reasonable ability to repay the loan, according to the terms, and all applicable taxes, insurance (including mortgage guarantee insurance), and other assessments". Also included in these calculations should be any payments for a second mortgage or other subordinate loans. Income verification is mandated for residential mortgages. Certain loan provisions, including prepayment penalties on some loans, and mandatory arbitration on all residential loans, are prohibited. This section also defined a "Qualified Mortgage" as any residential mortgage loan that the regular periodic payments for the loan does not increase the principal balance or allow the consumer to defer repayment of principal (with some exceptions), and has points and fees being less than 3% of the loan amount. The Qualified Mortgage terms are important to the extent that the loan terms plus an "Ability to Pay" presumption create a safe harbor situation concerning certain technical provisions related to foreclosure. Residential and 1- to 4-unit single family residential real estate are enforced by: Federal Trade Commission, the Bureau of Consumer Financial Protection, and a state attorney general. Commercial enforcement is by the Financial regulatory agency that supervised the financial institution originating the loan. GAO is commissioned to study current inter-agency efforts to reduce mortgage foreclosure and eliminate rescue scams and loan modification fraud. 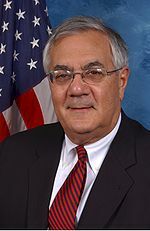 Barney Frank, who in 2003 told auditors warning him of the risk caused by government subsidies in the mortgage market, "I want to roll the dice a little bit more in this situation toward subsidized housing"  proposed his own legislative package of financial reforms in the House, did not comment on the Stability Act directly, but rather indicated that he was pleased that reform efforts were happening at all: "Obviously, the bills aren't going to be identical, but it confirms that we are moving in the same direction and reaffirms my confidence that we are going to be able to get an appropriate, effective reform package passed very soon." During a Senate Republican press conference on April 21, 2010, Richard Shelby reported that he and Dodd were meeting "every day" and were attempting to forge a bipartisan bill. Shelby also expressed his optimism that a "good bill" will be reached, and that "we're closer than ever." Saxby Chambliss echoed Shelby's sentiments, saying, "I feel exactly as Senator Shelby does about the Banking Committee negotiations," but voiced his concern about maintaining an active derivatives market and not driving financial firms overseas. Kay Bailey Hutchison indicated her desire to see state banks have access to the Fed, while Orrin Hatch had concerns over transparency, and the lack of Fannie and Freddy reform. Ed Yingling, president of the American Bankers Association, regarded the reforms as haphazard and dangerous, saying, "To some degree, it looks like they're just blowing up everything for the sake of change. . . . If this were to happen, the regulatory system would be in chaos for years. You have to look at the real-world impact of this." The Securities Industry and Financial Markets Association (SIFMA)—the "top Wall Street lobby"—has expressed support for the law, and has urged Congress not to change or repeal it in order to prevent a stronger law from passing. A survey by RIMES of senior investment banking figures in the U.S. and UK showed that 86 percent expect that Dodd–Frank will significantly increase the cost of their data operations. An editorial in the Wall Street Journal speculated that the law would make it more expensive for startups to raise capital and create new jobs; other opinion pieces suggest that such an impact would be due to a reduction in fraud or other misconduct. The tier 1 ratio represents the strength of the financial cushion that a bank maintains; the higher the ratio, the stronger the financial position of the bank, other things equal. Dodd–Frank set standards for improving this ratio and has been successful in that regard. The Dodd–Frank Act has several provisions that call upon the Securities and Exchange Commission (SEC) to implement several new rules and regulations that will affect corporate governance issues surrounding public corporations in the United States. Many of the provisions put in place by Dodd–Frank require the SEC to implement new regulations, but intentionally do not give specifics as to when regulations should be adopted or exactly what the regulations should be. This will allow the SEC to implement new regulations over several years and make adjustments as it analyzes the environment. Public companies will have to work to adopt new policies in order to adapt to the changing regulatory environment they will face over the coming years. Section 951 of Dodd–Frank deals with executive compensation. The provisions require the SEC to implement rules that require proxy statements for shareholder meetings to include a vote for shareholders to approve executive compensation by voting on "say on pay" and "golden parachutes." SEC regulations require that at least once every three years shareholders have a non-binding say-on-pay vote on executive compensation. While shareholder are required to have a say-on-pay vote at least every three years, they can also elect to vote annually, every two years, or every third year. The regulations also require that shareholders have a vote at least every six years to decide how often they would like to have say-on-pay votes. In addition, companies are required to disclose any golden parachute compensation that may be paid out to executives in the case of a merger, acquisition, or sale of major assets. Proxy statements must also give shareholders the chance to cast a non-binding vote to approve golden parachute policies. Although these votes are non-binding and do not take precedence over the decisions of the board, failure to give the results of votes due consideration can cause negative shareholder reactions. Regulations covering these requirements were implemented in January 2011 and took effect in April 2011. Section 952 of Dodd–Frank deals with independent compensation committees as well as their advisors and legal teams. These provisions require the SEC to make national stock exchanges set standards for the compensation committees of publicly traded companies listed on these exchanges. Under these standards national stock exchanges are prohibited from listing public companies that do not have an independent compensation committee. To insure that compensation committees remain independent, the SEC is required to identify any areas that may create a potential conflict of interest and work to define exactly what requirements must be met for the committee to be considered independent. Some of the areas examined for conflicts of interest include other services provided by advisors, personal relationships between advisors and shareholders, advisor fees as a percentage of their company's revenue, and advisors' stock holdings. These provisions also cover advisors and legal teams serving compensation committees by requiring proxy statements to disclose any compensation consultants and include a review of each to ensure no conflicts of interest exist. Compensation committees are fully responsible for selecting advisors and determining their compensation. Final regulations covering issues surrounding compensation committees were implemented in June 2012 by the SEC and took effect in July 2012. Under these regulations the New York Stock Exchange (NYSE) and NASDAQ also added their own rules regarding the retention of committee advisors. These regulations were approved by the SEC in 2013 and took full effect in early 2014. Section 953 of Dodd–Frank deals with pay for performance policies to determine executive compensation. Provisions from this section require the SEC to make regulations regarding the disclosure of executive compensation as well as regulations on how executive compensation is determined. New regulations require that compensation paid to executives be directly linked to financial performance including consideration of any changes in the value of the company's stock price or value of dividends paid out. The compensation of executives and the financial performance justifying it are both required to be disclosed. In addition, regulations require that CEO compensation be disclosed alongside the median employee compensation excluding CEO compensation, along with ratios comparing levels of compensation between the two. Regulations regarding pay for performance were proposed by the SEC in September 2013 and were adopted in August 2015. Section 954 of Dodd–Frank deals with clawback of compensation policies, which work to ensure that executives do not profit from inaccurate financial reporting. These provisions require the SEC to create regulations that must be adopted by national stock exchanges, which in turn require publicly traded companies who wish to be listed on the exchange to have clawback policies. These policies require executives to return inappropriately awarded compensation, as set forth in section 953 regarding pay for performance, in the case of an accounting restatement due to noncompliance with reporting requirements. If an accounting restatement is made then the company must recover any compensation paid to current or former executives associated with the company the three years prior to the restatement. The SEC proposed regulations dealing with clawback of compensation in July 2015. Section 955 of Dodd–Frank deals with employees' and directors' hedging practices. These provisions stipulate that the SEC must implement rules requiring public companies to disclose in proxy statements whether or not employees and directors of the company are permitted to hold a short position on any equity shares of the company. This applies to both employees and directors who are compensated with company stock as well as those who are simply owners of company stock. The SEC proposed rules regarding hedging in February 2015. Additional provisions set forth by Dodd–Frank in section 972 require public companies to disclose in proxy statements reasons for why the current CEO and chairman of the board hold their positions. The same rule applies to new appointments for CEO or chairman of the board. Public companies must find reasons supporting their decisions to retain an existing chairman of the board or CEO or reasons for selecting new ones to keep shareholders informed. Provisions from Dodd–Frank found in section 922 also address whistle blower protection. Under new regulations any whistle blowers who voluntarily expose inappropriate behavior in public corporations can be rewarded with substantial compensation and will have their jobs protected. Regulations entitle whistle blowers to between ten and thirty percent of any monetary sanctions put on the corporation above one million dollars. These provisions also enact anti-retaliation rules that entitle whistle blowers the right to have a jury trial if they feel they have been wrongfully terminated as a result of whistle blowing. If the jury finds that whistle blowers have been wrongfully terminated, then they must be reinstated to their positions and receive compensation for any back-pay and legal fees. This rule also applies to any private subsidiaries of public corporations. The SEC put these regulations in place in May 2011. Section 971 of Dodd–Frank deals with proxy access and shareholders' ability to nominate candidates for director positions in public companies. Provisions in the section allow shareholders to use proxy materials to contact and form groups with other shareholders in order to nominate new potential directors. In the past, activist investors had to pay to have materials prepared and mailed to other investors in order to solicit their help on issues. Any shareholder group that has held at least three percent of voting shares for a period of at least three years is entitled to make director nominations. However, shareholder groups may not nominate more than twenty five percent of a company's board and may always nominate at least one member even if that one nomination would represent over twenty five percent of the board. If multiple shareholder groups make nominations then the nominations from groups with the most voting power will be considered first with additional nominations being considered up to the twenty five percent cap. In February 2013 Kansas attorney general Derek Schmidt announced that Kansas along with Alabama, Georgia, Ohio, Oklahoma, Nebraska, Michigan, Montana, South Carolina, Texas, and West Virginia would join the lawsuit. The second amended complaint included those new states as plaintiffs. Associated Press reported that in response to the costs that the legislation places on banks, some banks have ended the practice of giving their customers free checking. Small banks have been forced to end some businesses such as mortgages and car loans in response to the new regulations. The size of regulatory compliance teams has grown. The Heritage Foundation, calling attention to the new ability of borrowers to sue lenders for misjudging their ability to repay a loan, predicted that smaller lenders would be forced to exit the mortgage market due to increased risk. One study has shown that smaller banks have been hurt by the regulations of the Dodd–Frank Act. 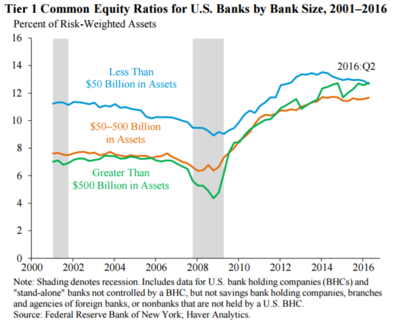 Community banks' share of the US banking assets and lending market fell from over 40% in 1994 to around 20% today, although this is a misleading at best but highly likely inaccurate number considering the Dodd-Frank was implemented 16 years later than 1994. These experts believe that regulatory barriers fall most heavily on small banks, even though legislators intended to target large financial institutions. Complying with the statute seems to have resulted in job shifting or job creation in the business of fulfilling reporting requirements, while making it more difficult to fire employees who report criminal violations. Opponents of the Dodd–Frank Law believe that it will affect job creation, in a sense that because of stricter regulation unemployment will increase significantly. However, the Office of Management and Budget attempts to "monetize" benefits versus costs to prove the contrary. The result is a positive relationship where benefits exceed costs: "During a 10-year period OMB reviewed 106 major regulations for which cost and benefit data were available [...] $136 billion to $651 billion in annual benefits versus $44 billion to $62 billion in annual costs" (Shapiro and Irons, 2011, p. 8). According to Federal Reserve Chairwoman Janet Yellen in August 2017, "The balance of research suggests that the core reforms we have put in place have substantially boosted resilience without unduly limiting credit availability or economic growth." Some experts have argued that Dodd–Frank does not protect consumers adequately and does not end too big to fail. Regarding the Republican-led rollback of some provisions of Dodd-Frank in 2018, this move from increased regulation after a crisis to deregulation during an economic boom has been a recurrent feature in the United States. The SEC's 2017 annual report on the Dodd-Frank whistleblower program stated: "Since the program’s inception, the SEC has ordered wrongdoers in enforcement matters involving whistleblower information to pay over $975 million in total monetary sanctions, including more than $671 million in disgorgement of ill-gotten gains and interest, the majority of which has been...returned to harmed investors." Whistleblowers receive 10-30% of this amount under the Act. The Act established the Consumer Financial Protection Bureau (CFPB), which has the mission of protecting consumers in the financial markets. Then-CFPB Director Richard Cordray testified on April 5, 2017 that: "Over the past five years, we have returned almost $12 billion to 29 million consumers and imposed about $600 million in civil penalties." The CFPB publishes a semi-annual report on its activities. ^ Guida, Victoria; Warmbrodt, Zachary (May 21, 2018). "Trump wounds but can't kill Obama's Wall Street rules". Politico. ^ "The Impact of the Dodd-Frank Act on Financial Stability and Economic Growth" (PDF). Brookings. October 24, 2014. Archived (PDF) from the original on September 5, 2017. Retrieved August 31, 2017 ; Martin Neil Baily; Aaron Klein; Justin Schardin (January 2017). "The Impact of the Dodd-Frank Act on Financial Stability and Economic Growth". The Russell Sage Foundation Journal of the Social Sciences. 3 (1): 20. doi:10.7758/RSF.2017.3.1.02. 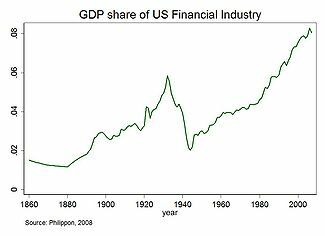 ^ "Did Dodd-Frank really hurt the US economy?". Financial Times. February 13, 2017. Archived from the original on January 24, 2018. Retrieved 2018-01-23. ^ Lux, Marshall; Robert, Greene (2015). "The State and Fate of Community Banking". Harvard Mossavar-Rahmani Center for Business and Government. Archived from the original on January 20, 2017. Retrieved January 21, 2017. ^ Calmes, Jackie (October 13, 2008). "Both Sides of the Aisle See More Regulation". nytimes.com. The New York Times Company. Archived from the original on 8 February 2017. Retrieved 7 February 2017. Initial speech: Obama B. (June 17, 2009). Remarks by the President on 21st Century Financial Regulatory Reform Archived 2017-01-27 at the Wayback Machine. White House. Original 89-page proposal document at GPO: A New Foundation : rebuilding financial supervision and regulation Archived 2016-01-29 at the Wayback Machine. Obama's Financial Reform Plan: The Condensed Version Archived 2017-05-17 at the Wayback Machine. Wall Street Journal. ^ Obama B. (June 25, 2010). Remarks by the President on Wall Street Reform Archived 2010-07-23 at the Wayback Machine. White House. Cho, D; Appelbaum, B (January 2010). "Obama's 'Volcker Rule' shifts power away from Geithner". Washington Post. Archived from the original on 2017-06-08. Obama, Barack (January 2010). "Remarks by the President on Financial Reform". White House Office of the Press Secretary. Archived from the original on 2015-01-29. ^ a b c "Side-by-Side Comparison Chart – Key Senate and House Bill Issues". Pew Financial Reform Project. Davis Polk & Wardwell. Archived from the original on 2011-07-27. ^ Indiviglio, D. (2010). "Congress' Conference Committee Completed for Financial Reform". The Atlantic. Archived from the original on 2017-01-27. ^ Paletta, Damian (June 25, 2010). "It Has A Name: The Dodd/Frank Act". The Wall Street Journal. Archived from the original on July 24, 2010. Retrieved July 22, 2010. ^ a b c d "Bill Summary & Status – 111th Congress (2009–2010) – H.R.4173 – All Information – THOMAS (Library of Congress)". Library of Congress. Archived from the original on August 19, 2014. Retrieved July 22, 2010. ^ "Senate Passes Landmark Financial Reform Bill". Washington Independent. Archived from the original on 2010-07-20. ^ "Congress Starts to Merge Financial Reform Bills". New York Times. June 11, 2010. Archived from the original on August 18, 2010. ^ Applebaum, Binyamin; Herszenhorn, David M. (July 15, 2010). "Financial Overhaul Signals Shift on Deregulation". New York Times. "Financial Reform Bill Leaves Proxy Access Rules with SEC". Business Ethics. Archived from the original on 2015-01-23. "SEC Votes to Propose Rule Amendments to Facilitate Rights of Shareholders to Nominate Directors". SEC. Archived from the original on 2017-07-07. ^ Drawbaugh, Kevin (June 17, 2010). "White House intervenes on shareholder rights". Reuters. Retrieved August 1, 2010. ^ Durbin Amendment Archived 2013-07-19 at the Wayback Machine to S. 3217 Archived 2012-12-17 at the Wayback Machine, the Senate version. The amendment passed 64–33 Archived 2017-05-04 at the Wayback Machine. ^ Durbin, D. "Durbin Statement On His Debit Card Swipe Fee Amendment". U.S. Senate. Archived from the original on 2010-07-29. "The Durbin Amendment Ignites a Lobbying Frenzy on Capitol Hill". Digital Transaction News. Archived from the original on 2010-06-11. "Durbin Cedes Ground on Debit Caps as Support Erodes (Update1)". BusinessWeek. Archived from the original on 2010-07-23. ^ Major Parts of the Financial Regulation Overhaul Archived 2010-05-24 at the Wayback Machine. New York Times. ^ Hartenstein, Meena (July 15, 2010). "Wall Street reform passes Senate: 60–39 vote approves sweeping bill to overhaul financial system". New York Daily News. Archived from the original on July 18, 2010. Retrieved July 22, 2010. ^ Cooper, Helene (July 21, 2010). "Obama Signs Legislation Overhauling Financial Rules". New York Times. Archived from the original on May 8, 2018. Retrieved July 21, 2010. ^ Bump, Philip (October 30, 2014). "How 'Dodd-Frank' is becoming the new 'Obamacare'". Washington Post. ^ Borak, Donna (June 8, 2017). "House votes to kill Dodd-Frank. Now what?". Archived from the original on November 29, 2017. Retrieved June 9, 2017. ..."advanced the 'crown jewel' of the GOP-led regulatory reform effort, effectively gutting the Dodd-Frank financial regulations that were put in place during the Obama administration." ^ Rappeport, Alan (June 8, 2017). "Bill to Erase Some Dodd-Frank Banking Rules Passes in House". The New York Times. The New York Times. Archived from the original on November 29, 2017. Retrieved November 29, 2017. ^ Bryan, Bob (June 9, 2017). "The House quietly voted to destroy post-financial-crisis Wall Street regulations". Business Insider. Archived from the original on November 29, 2017. Retrieved June 9, 2017. ^ Bryan, Bob (May 5, 2017). "Here's a breakdown of the Republican plan to tear up Wall Street regulations". Business Insider. Archived from the original on November 29, 2017. Retrieved November 29, 2017. ^ Finkle, Victoria (June 8, 2017). "How House Bill Would Dismantle an Array of Dodd-Frank Reforms". The New York Times. Archived from the original on November 29, 2017. Retrieved November 29, 2017. ^ a b c d e f g h i j k l m n "Dodd–Frank Wall Street Reform and Consumer Protection Act (Enrolled Final Version – HR 4173)" (PDF). THOMAS. Archived (PDF) from the original on October 7, 2010. Retrieved July 20, 2010. ^ "Restoring American Financial Stability Act of 2010 – Summary" (PDF). 111th Congress. Archived from the original (PDF) on 2014-12-06. Retrieved 2010-04-22. ^ "Dodd–Frank SEC Registration – An Overview". Allan J. P. Rooney, P.C. December 14, 2010. Archived from the original on July 9, 2012. ^ "Summary and Implementation Schedule of the Dodd–Frank Act". The Harvard Law School Forum on Corporate Governance and Financial Regulation. July 15, 2010. Archived from the original on July 19, 2010. Retrieved July 25, 2010. ^ Paul Krugman (2016-02-03). "Half A Loaf, Financial Reform Edition". Archived from the original on 2017-08-23. Should we have had a stiffer financial reform? Definitely — required capital ratios should be a lot higher than they are. But Dodd–Frank's rules — especially, I think, the prospect of being classed as a SIFI, a strategically important institution subject to tighter constraints, have had a real effect in reducing risk. ^ Board of Governors of the Federal Reserve System, Federal Deposit Insurance Corporation. "Agencies Provide Feedback on Second Round Resolution Plans of "First-Wave" Filers: Firms required to address shortcomings in 2015 submissions". Archived from the original on 2016-09-13. Each plan, commonly known as a living will, must describe the company's strategy for rapid and orderly resolution in the event of material financial distress or failure of the company. The 11 firms in the first group of filers include Bank of America, Bank of New York Mellon, Barclays, Citigroup, Credit Suisse, Deutsche Bank, Goldman Sachs, JPMorgan Chase, Morgan Stanley, State Street Corp., and UBS. [...] The Federal Reserve Board determined that the 11 banking organizations must take immediate action to improve their resolvability and reflect those improvements in their 2015 plans. ^ Mike Konczal (2016-07-01). "How Sanders and Clinton Each Approach Shadow Banking". Archived from the original on 2016-10-02. ^ a b "Archived copy". Archived from the original on 2013-11-29. Retrieved 2013-12-05. CS1 maint: Archived copy as title (link), Office of the Whistleblower. ^ "FDIC: Press Releases - PR-161-2010 7/21/2010". www.fdic.gov. Archived from the original on 2011-02-15. ^ Lemke and Lins, Regulation of Investment Advisers, §§1:1, 1:31–1:32, 1:35–1:39 (Thomson West, 2013 ed.). ^ Lemke, Lins, Hoenig and Rube, Hedge Funds and Other Private Funds: Regulation and Compliance, §§3:2–3:8 (Thomson West, 2013 ed.). ^ "Insurers: Is federal regulation coming?" (PDF). www.pwc.com. PwC Financial Services Regulatory Practice. December 2013. ^ "The Volcker Rule Provisions" (PDF). Morrison & Foerster. Archived (PDF) from the original on December 29, 2010. Retrieved July 22, 2010. ^ a b "The Volcker Rule" (PDF). Skadden. Archived (PDF) from the original on July 16, 2011. Retrieved July 22, 2010. ^ Dechert LLP (July 2010). The Regulatory Reset of the OTC Derivatives Markets (PDF) (Report). Archived from the original (PDF) on 2013-05-07. ^ a b c d e f Skadden. The Office of the Whistleblower (PDF) (Report). Archived from the original on 2013-11-29. ^ "Archived copy". Archived from the original on 2014-02-10. Retrieved 2014-02-11. CS1 maint: Archived copy as title (link), SEC and CFTC whistleblower programs. ^ "Obama signs bill revoking SEC FOIA carve-outs". POLITICO. Archived from the original on 2016-01-29. Retrieved 2016-01-25. ^ Regulators overhaul risk-retention proposal Archived 2013-10-11 at the Wayback Machine. The Hill. ^ Regulators drop 20%-down requirement from mortgage proposal Archived 2013-09-28 at the Wayback Machine. Bizjournals. ^ "First take: Ten key points from the final risk retention rule" (PDF). www.pwc.com. PwC Financial Services Regulatory Practice. October 2014. Archived (PDF) from the original on 2014-12-31. ^ H.R. 4173, § 942; amending section 7 of the Securities Act of 1933 (15 U.S.C. § 77) by adding: (c) DISCLOSURE REQUIREMENTS. ^ "Brief Summary of the Dodd–Frank Wall Street Reform and Consumer Protection Act" (PDF). Archived from the original (PDF) on 2010-07-10. Retrieved August 1, 2010. ^ a b "SEC Adopts Temporary Rule Requiring Municipal Advisors to Register With Agency; 2010-162; September 2, 2010". Sec.gov. 2010-09-02. Archived from the original on December 28, 2011. Retrieved 2012-03-15. ^ "RegReform: 9.18 Municipal Securities". Aba.com. 2010-07-19. Archived from the original on 2012-04-02. Retrieved 2012-03-15. ^ Dennis, Brady (July 20, 2010). "Battle looms over new job heading financial watchdog". The Washington Post. Archived from the original on February 13, 2011. Retrieved July 23, 2010. ^ Levitin AJ. (2012). Rising Regulatory Compliance Costs and Their Impact on the Health of Small Financial Institutions Archived 2012-12-13 at the Wayback Machine. 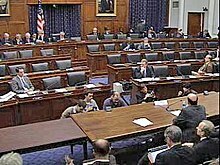 Written Testimony to the House Financial Services Committee, Subcommittee on Financial Institutions and Consumer Credit. ^ "Resolution planning: A public peek into the plans" (PDF). www.pwc.com/us/en/financial-services/regulatory-services/publications/resolution-planning.jhtml. PwC Financial Services Regulatory Practice, October, 2013. Archived (PDF) from the original on 2013-11-02. ^ "Summary of Key Provisions: Dodd–Frank Wall Street Reform and Consumer Protection Act (Pub. L. 111–203)" (PDF). Archived (PDF) from the original on 2015-12-28. ^ Security Council Committee established pursuant to resolution 1533 (2004) concerning the Democratic Republic of the Congo (2011-06-11). "Interim report of the Group of Experts on the DRC". United Nations. Archived from the original on 2012-01-26. Retrieved 2011-07-11. ^ a b Nasiripour, Shahien; Ryan Grim (November 10, 2009). "Dodd's Banking Bill Takes The Fed Down A Notch Or Two: HELP US DIG THROUGH IT". Huffington Post. Archived from the original on February 11, 2017. ^ a b c Appelbaum, Binyamin; Brady Dennis (November 11, 2009). "Legislation by Senator Dodd would overhaul banking regulators". Washington Post. Archived from the original on November 15, 2016. ^ Grim, Ryan (October 22, 2009). "GOP Sen. Shelby: Reorganize The Fed". Huffington Post. Archived from the original on February 11, 2017. ^ Wallison, Peter. "Hey, Barney Frank: The Government Did Cause the Housing Crisis". theatlantic.com. Archived from the original on 23 March 2018. Retrieved 8 May 2018. ^ "Wall Street lobbyists to GOP: Hands off Dodd-Frank". Washington Examiner. 2011-02-13. Archived from the original on 2018-12-16. Retrieved 2018-12-16. ^ "Rimes survey reveals increased regulation focusing buy-side on data governance". RIMES. Archived from the original on 2014-02-04. Retrieved 2014-03-27. ^ M Nicolas Firzli (January 2010), Bank Regulation and Financial Orthodoxy: the Lessons from the Glass-Steagall Act (PDF) (in French), archived from the original (PDF) on 2010-02-15, retrieved 2010-01-08 . ^ M. Nicolas J. Firzli quoted by Marie Lepesant (June 11, 2012). "Le Modèle des Banques Françaises en Question". Le Parisien Aujourd’hui en France. . Archived from the original on 18 December 2012. Retrieved 12 June 2012. ^ Editorial, Page (July 3, 2012). "Restoring trust after Diamond". Financial Times. Archived from the original on 16 July 2012. Retrieved 15 July 2012. quoting FT Editorial Page. ^ "Angels Out of America – WSJ.com". Online.wsj.com. 2010-04-22. Archived from the original on 2017-09-11. Retrieved 2012-03-15. ^ "SEC Stepping Up Fund Enforcement Actions: The Venture Alley: Entrepreneurs, Startups, Venture Capital, Angel Investors". The Venture Alley. Archived from the original on 2012-04-26. Retrieved 2012-03-15. ^ "CEA 2017 Economic Report of the President-Chapter One-Eight Years of Recovery and Reinvestment" (PDF). Whitehouse.gov. Archived from the original (PDF) on 2016-12-25. Retrieved December 19, 2016. ^ a b c d Cogut, Casey (June 2011). "Corporate Governance and Reform – The Impact of the Dodd–Frank Act". Who's Who Legal. Who's Who Legal. Archived from the original on 10 November 2016. Retrieved 3 November 2016. ^ a b c d e f g h i j k l Weil, Andrew (3 December 2013). "Dodd–Frank affects private companies too: practice points to note". DLA Piper. DLA Piper. Archived from the original on 10 November 2016. Retrieved 3 November 2016. ^ a b c d e f g h i Omberg, Tom (Fall 2012). "Strategies for Going Public: The changing landscape for IPOs" (PDF). Deloitte. Deloitte Advisory. Archived (PDF) from the original on 10 November 2016. Retrieved 3 November 2016. ^ a b c d e f g h i j k l m n o Jenson, David (15 August 2010). "Summary of Corporate Governance Provisions in the Dodd–Frank Act". Dodd-Frank.com. Dodd-Frank.com. Archived from the original on 10 November 2016. Retrieved 3 November 2016. ^ a b c d e f g h i j k l m n o p q Wilson, John (3 December 2010). "Implications of the Dodd–Frank Act on Corporate Governance Preparation for IPO Issuers" (PDF). Boardmember.com. Boardmember.com. Archived (PDF) from the original on 10 November 2016. Retrieved 3 November 2016. ^ a b c d Bachelder, Joseph (17 April 2014). "Executive Compensation Under Dodd–Frank: an Update". Harvard Law School Forum. Harvard Law School. Archived from the original on 10 November 2016. Retrieved 3 November 2016. ^ Gregory, Holly (14 August 2015). "SEC Adopts CEO pay Ratio Disclosure Rule". Harvard Law School Forum. Harvard Law School. Archived from the original on 10 November 2016. Retrieved 3 November 2016. ^ Bachelder, Joseph (28 October 2015). "The SEC Proposed Clawback Rule". Harvard Law School Forum. Harvard Law School. Archived from the original on 10 November 2016. Retrieved 3 November 2016. ^ a b Aguilar, Luis (16 February 2015). "Aligning the Interest of Company Executives and Directors with Shareholders". Harvard Law School Forum. Harvard Law School. Archived from the original on 10 November 2016. Retrieved 3 November 2016. ^ Hall, Christine. "Dodd–Frank Unconstitutional Power-Grab, Says New Lawsuit". Competitive Enterprise Institute. Archived from the original on 2013-02-22. ^ "Dodd-Frank Challenge – Amended Complaint". 20 September 2012. Archived from the original on 28 September 2012. ^ Schmidt, Derek. "AG Schmidt joins challenge to Dodd–Frank Act". Attorney General of Kansas. Archived from the original on 2013-02-21. ^ Sam, Kazman. "Dodd–Frank Second Amended Complaint". Competitive Enterprise Institute. Archived from the original on 2013-02-18. ^ Joel Rosenblatt; Tom Schoenberg (August 2, 2013). "Dodd–Frank Stands as Judge Rejects Suit by States, Bank". Bloomberg.com. Archived from the original on October 29, 2013. Retrieved October 23, 2013. ^ Adler, Jonathan H. (July 24, 2015). "D.C. Circuit revives constitutional challenge to Consumer Financial Protection Bureau". Washington Post. Archived from the original on August 14, 2015. Retrieved August 10, 2015. ^ State National Bank of Big Spring, et al. v. Lew Archived 2015-08-07 at the Wayback Machine, no. 13-5247 (D.C. Cir, July 24, 2015). ^ a b c d "Congressional Budget Office Cost Estimate" (PDF). Congressional Budget Office. April 21, 2010. Archived (PDF) from the original on April 29, 2010. ^ https://www.facebook.com/abhabhattarai; https://www.facebook.com/profile.php?id=1216470. "Four years into Dodd-Frank, local banks say this is the year they'll feel the most impact". Washington Post. Archived from the original on 2017-08-23. ^ Lux, Marshall; Robert, Greene (2015). ""The State and Fate of Community Banking"". Harvard Mossavar-Rahmani Center for Business and Government. Archived from the original on 2017-01-20. ^ Alper, Alexandra (October 27, 2011). "Analysis: Dodd–Frank, the jobs bill no one talks about". Reuters. Archived from the original on December 31, 2011. Retrieved 2012-03-15. ^ Dinsmore & Shohl LLP on 7/29/2011 (2011-07-29). "Dodd–Frank: Final Whistleblower Provisions Take Effect August 12th Is Your Company Ready? | Dinsmore & Shohl LLP". JDSupra. Archived from the original on 2011-09-11. Retrieved 2012-03-15. ^ "The Dodd–Frank Financial Reform | Econofact". Econofact. 2017-09-08. Archived from the original on 2017-09-11. Retrieved 2017-09-11. ^ Skeel, David 2010. The New Financial Deal: Understanding the Dodd–Frank Act and Its (Unintended) Consequences Archived 2015-03-26 at the Wayback Machine. Hoboken NJ: John Wiley & Sons. ^ "Regulatory Cycles: Revisiting the Political Economy of Financial Crises". SSRN. May 1, 2016. SSRN 2772373. ^ "SEC-2017 Annual Report to Congress-Whistleblower Program-November 15, 2017" (PDF). sec.gov. Archived (PDF) from the original on 14 April 2018. Retrieved 8 May 2018. ^ "Prepared Opening Statement of CFPB Director Richard Cordray Before the House Committee on Financial Services - Consumer Financial Protection Bureau". consumerfinance.gov. Archived from the original on 4 May 2018. Retrieved 8 May 2018. ^ "Semi-Annual Report Spring 2017 - Consumer Financial Protection Bureau". Consumer Financial Protection Bureau. Archived from the original on 5 May 2018. Retrieved 8 May 2018.